Now that the components of a CNC controller system have been identified, lets look closer into CNC control though what we will be referring to as command signals. First lets review how the computer or the stand alone user interface communicates to the controller. Most systems today operate on a step and direction format of command signals. Some higher end machines use a proprietary analog or digital signal, but it is usually a variation of the step and direction format. The computer is responsible for generating these control signals. It interprets a language such as G-code into the signals. More will be discussed on the computer and software in the CNC software section. The step and direction signal format describes itself. There are two commands sent to each driver. The step signal and the direction signal. As stated in the controller component section , the signals generated by the computer are 5V DC supplied to the controller via the communication (DB25) or the serial (DB9) port. The communication signals are a square wave form known as Transistor-to-Transistor Logic (TTL) signals. This signal is essentially a series of small pulses ranging from 0V to +5V that represent 0s and 1s in a binary computer language. This signal is a form of a Pulse-Width Modulated (PWM) signal where the duration of the pulse is varied to indicate information. 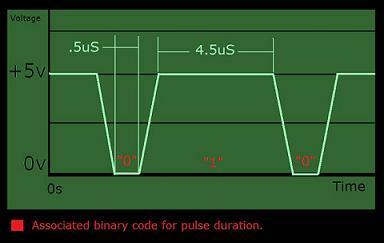 The duration of the pulse determines the binary code, either 0 or 1, as communicated by the computer and interpreted by the motor driver. Each motor driver is different, that is why it is important to understand the command signals and CNC control. Lets look at a popular stepper motor driver for example the Gecko G201. 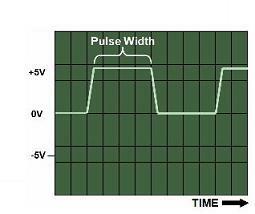 The product manual specifies that the minimum step pulse 0 time is 0.5 uS (half a microsecond). The minimum step pulse 1 time is 4uS. Refer to the image below for clarification. The direction signal would be similar but with a minimum of 1uS. For ever 1 received by the step signal input the motor driver would rotate the motor 1 step. The 0 or 1 signal received on the direction side would determine a clockwise or counterclockwise direction. The step signal and the direction signal will be sent simultaneously. The step signal may sit at 0 if no steps are commanded. However, the direction signal continuously streams a direction until the direction changes. So, why is all this important? Well, many low end drivers quote the same specifications as the higher end models except for the maximum frequency allowed. The G201 has a maximum of 200 kHz (200,000 pulses per second) which is very good. In many cases where high precision, speed, and micro stepping are combined, the frequency can be very high. This also ties in to the capabilities of your software, here the frequency is often referred to as kernel speed. To learn more about kernel speed and software go to the CNC controller software section. Odds are you will not need to know much in regards to the CNC command signals unless working on a homemade driver etc. However, understanding CNC control signals is very helpful when troubleshooting.